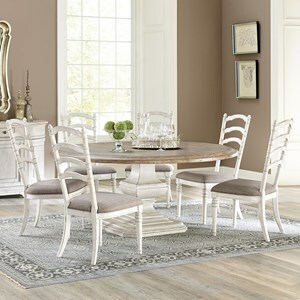 Welcome casual elegance into your dining space with this rectangular table and chair set, which includes six side chairs, and a leaf for accommodating more guests when needed. 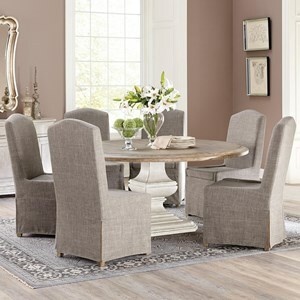 The Laurel Grove 7 Piece Rectangular Table and Chair Set by Legends Furniture at Reeds Furniture in the Los Angeles, Thousand Oaks, Simi Valley, Agoura Hills, Woodland Hills, California area. Product availability may vary. Contact us for the most current availability on this product. A variety of designs and finishes combine to create this cottage-inspired whole home collection, which has everything you need to create a relaxed and welcoming feel in your home. The Laurel Grove collection is a great option if you are looking for Cottage furniture in the Los Angeles, Thousand Oaks, Simi Valley, Agoura Hills, Woodland Hills, California area. 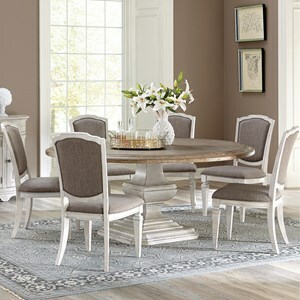 Browse other items in the Laurel Grove collection from Reeds Furniture in the Los Angeles, Thousand Oaks, Simi Valley, Agoura Hills, Woodland Hills, California area.